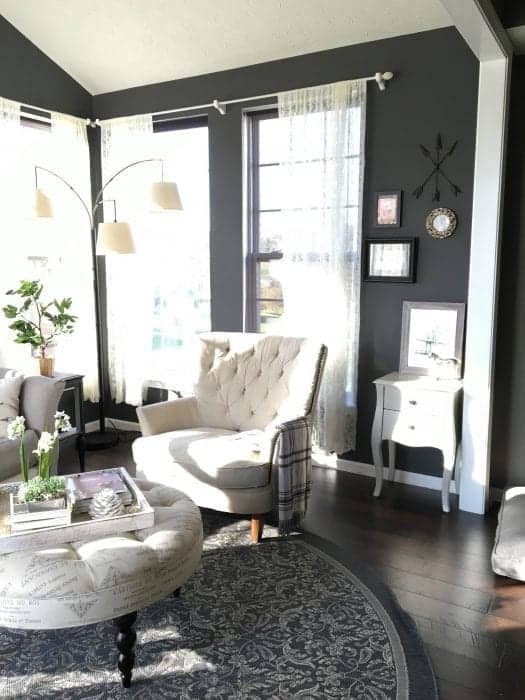 We have an open concept home, and I found that if you choose too many paint colors they tend to compete with one another, nothing looks cohesive and you risk having your home look like a patchwork quilt. I stuck with a single color in the main living area. In the adjacent rooms, I chose complementary paint colors with similar undertones in the sunroom and office. Discontinued but you can order it here. I tend to reuse paint in various parts of our house. I first bought “Fired Earth” for the stair rail project. Later I was inspired to use it for the kitchen backsplash. I bought a high-gloss finish for this project which glides on. The balusters are still just primed in white. 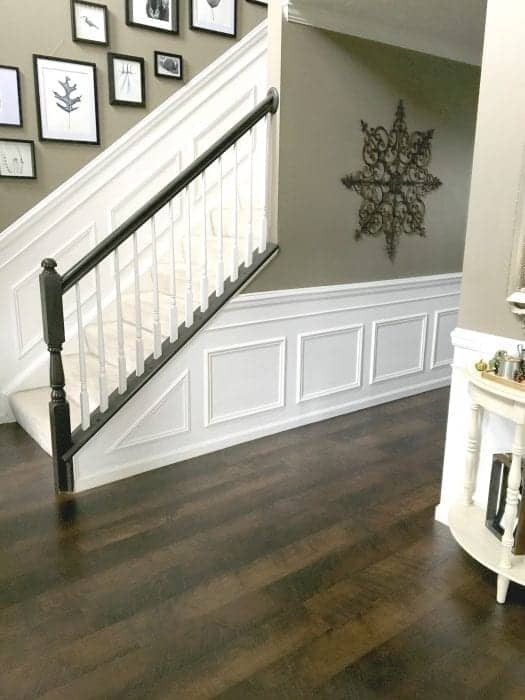 The wainscoting is a pure white in a paint specifically made for trim which comes in a satin sheen — a slight gloss makes it easier to keep clean but I still find I need to touch it up every year. At first, I was considering black for our railing but it looked way too harsh. Then I found Fired Earth which provided just enough brown undertones to soften the look. To break up the monotony of Moonlight Beach, our two story feature wall in the family room was painted in Grey Ghost. I liked how it looked against the adjacent walls in Moonlight beach. 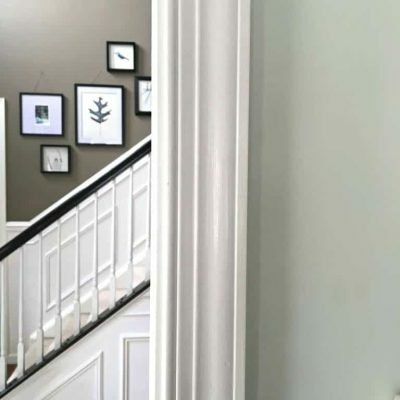 We painted the trim in Pegasus which looks like a pure white when paired with Grey Ghost. I didn’t get our sunroom quite right the first time around. It was painted a pale beige. I was always very sensitive to the “vibe” against the Moonlight Beach. While they didn’t clash, they didn’t complement each other perfectly, either. I wanted something a little more bold and dramatic. 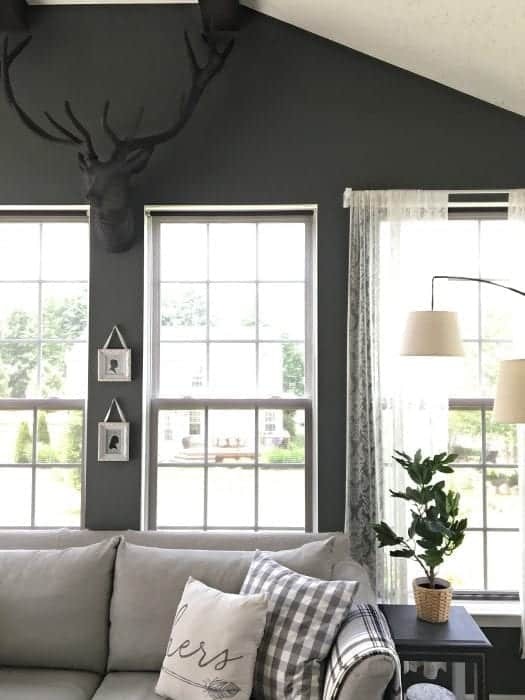 And this new, bolder Kendall Charcoal from Benjamin Moore definitely offered the cooler undertones that I crave. And I found it on one of my favorite blogger’s sites, you can click here to see how it looks in her home which is just beautiful! This was painted years ago, and again the original paint color is no longer and I can’t find the original paint can. But this one is very close. 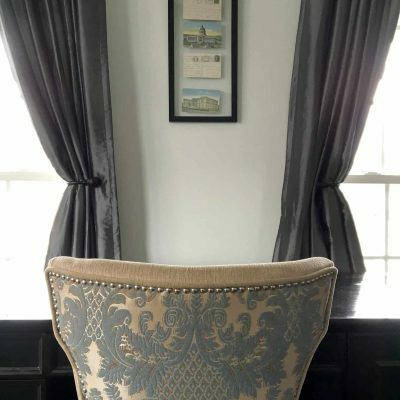 I find grey-blues very soothing and a perfect complement to the darker, bolder colors in the rest of the house. Choosing color is a big decision. I’ve made some wrong turns in the past — sometimes a color looks great in one season, but not in another. How a paint color looks in your home really can depend not only on the time of day, your physical location and the time of year, too! Soon I’ll share some tips on how I choose paint colors, but for now – how do YOU do it? What are your favorite paint colors these days! Love the colors you use. It is nice that you can use brown and black. I like both as accents in any room. Thank you, Marty. 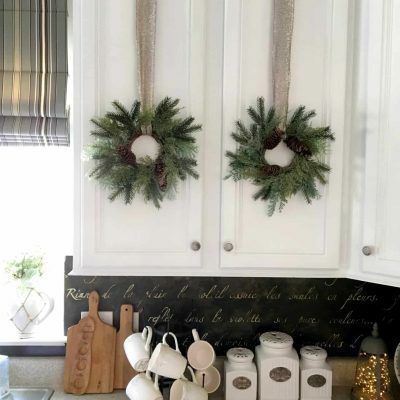 Love all of your decorating ideas! 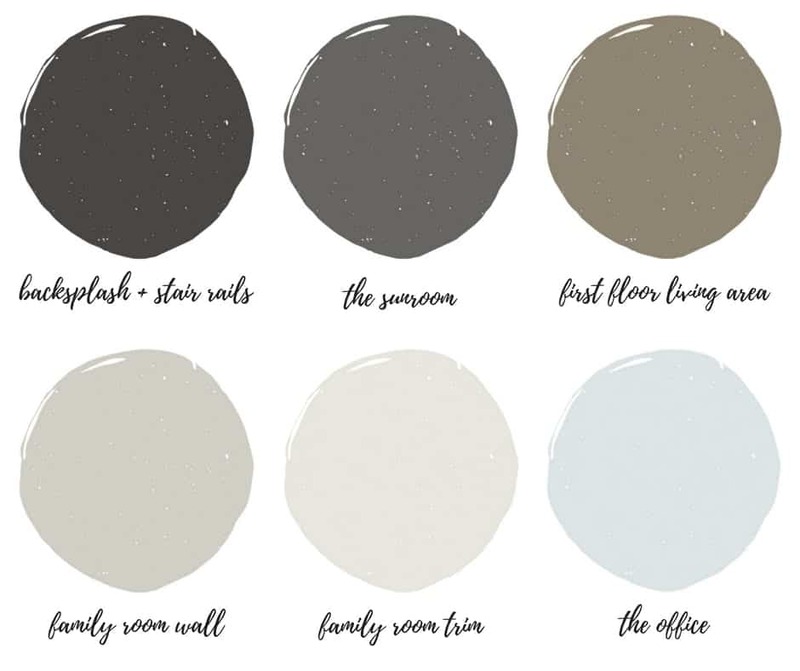 so, could you please share the names of the colors and who makes the paint (the 2 greys and beige) at the beginning of this site? Thank you. Yes I edited to include that under the picture. 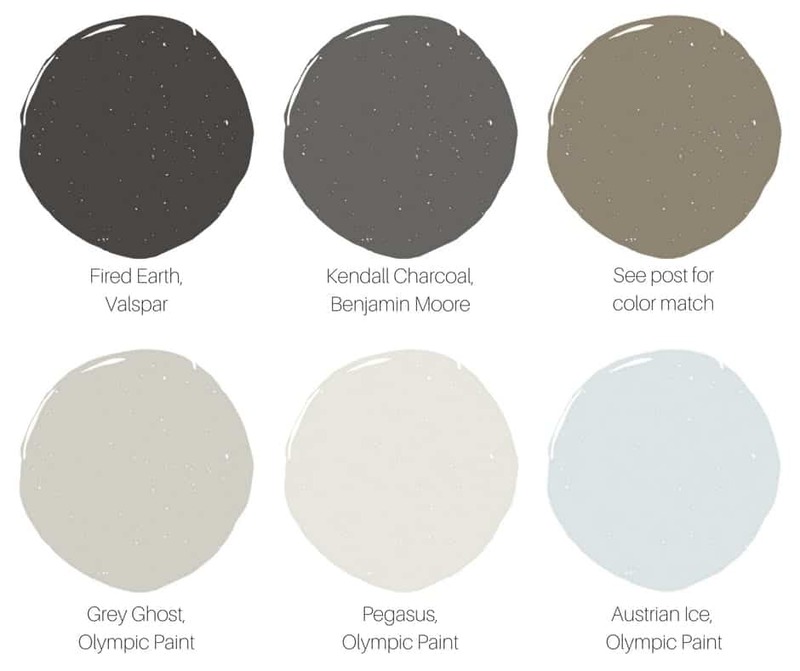 But be warned, “Moonlight Beach” by Valspar is now an entirely NEW color…so you have to order t the paint at the Lowe’s counter using the paint formula / code that I provided in the blog post. Have a good day! Thank you so much for this info on the colors for your main living area – it really solves a big problem that I [thought I] had! 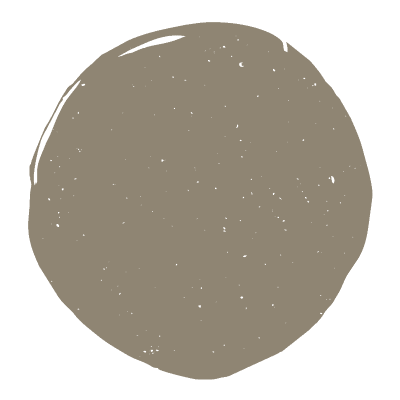 We are repainting out entire home in a color by Plascon called “Evasive White” – a very nice light grey. 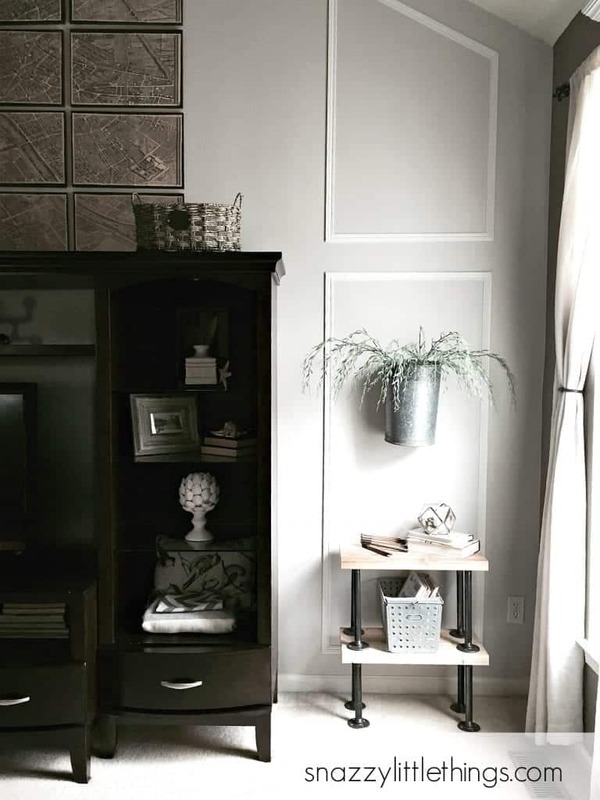 My corner suite in the TV section is a combination of taupe, black and cream stripes, and I was really worried about it fitting in with the light-grey walls and white accents. 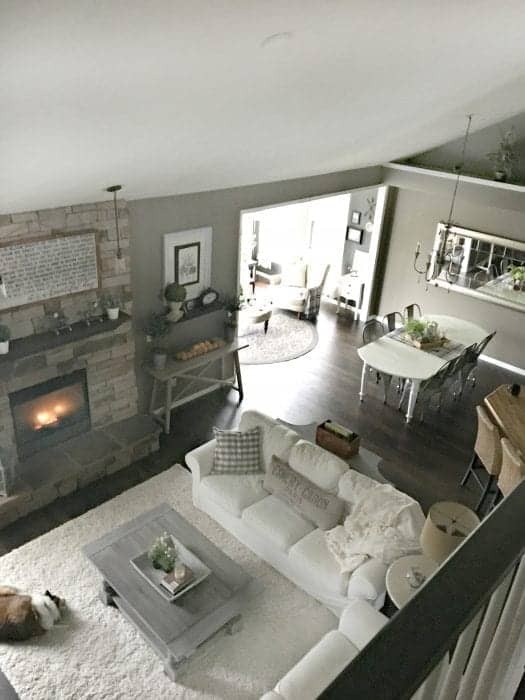 After seeing your pictures, though, I realize that I could easily match these colors, especially if I just add new scatter cushions to accentuate the light grey of the walls. It’s crazy how much paint can really update a space, loving those colors! I now live alone (widowed two years ) in a condo and for continuity, had every room except the bathrooms painted the same color and haven’t tired of it yet. The previous house was similar to yours – open plan, two-storey foyer, vaulted living room, etc. Due to the ceiling heights, my husband didn’t want to balance on scaffolding anymore so we hired a painter. For the entrance, dining room, kitchen, bedroom hall and living room, we chose Benjamin Moore “Florentine Plaster”. We had the front main hall and a recessed wall in the dining room painted in B.M. “Ranchwood” which went very well with the former chosen color. When I first saw Florentine Plaster up in the living room (faced West) and the dining room (faced East), I just about died!! I hated it and was convinced I’d made a huge and costly error; one I would have to live with BUT after the second day, I loved it as the constantly changing sun exposure gave it a slightly different color as it (the sun) moved from East to West. I now see that color mentioned in many Canadian decor magazines. 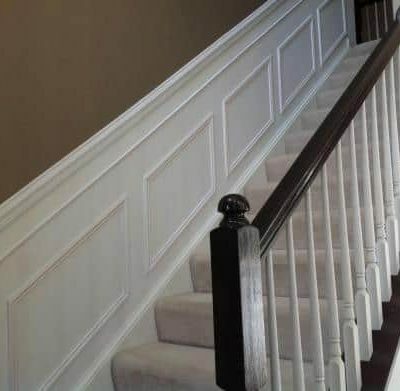 Paint decisions can be very intimidating – especially if you need to hire a professional painter!! Thank you! 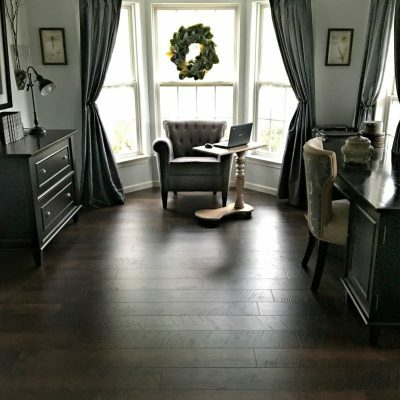 The flooring is Pergo Outlast+ in Molasses Maple. I have an entire article series here on the blog sharing the before & afters of each room.